That is fascinating Phill. 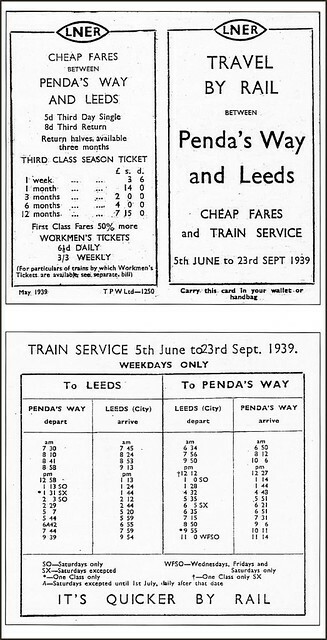 The fastest journey I spotted on a quick look was the 2 3 (Saturday Only) from Penda's Way that arrives in Leeds at 2 12, thus 9 minutes! I guess it did not stop at Crossgates and Osmondthorpe, but perhaps it still did. No Second Class in those days just First and plebs (sorry Third Class) except for the workmen's tickets. As a child in the late 1940's to very early 1950's I recall (though vaguely now) using Osmondthorpe Station. I llived at 101 Pendas Way in 1960's; about 100 yards past the shops going towards Barwick Road. The station was almost directly opposite. Although the tracks had been removed, the route was still there. Don't count the days; make the days count! As I expected, my friend who lives very close to your former address was astonished to learn of the existence of the station. Also, for those who believe in telepathy and I do in a rational way, the same friend has just rung again while I was half way through typing the above sentence !! It's many years since I saw what remains of the line. I shall be in Leeds next week and try to make time to visit it again. I have lived in Copmanthorpe (York) and now in Tadcaster and both have had railway stations that are now defunct. I've just seen a sort of 3D simulation of the railway between Crossgates and Wetherby, I have to say I'm suitably impressed. I'm also very impressed. They cannot have been easy to produce. Well worth looking through all of the set. PS I like the 'Scarcroft lane bridge 181211. Phill.D has taken a view of this bridge!'. That bridge and its deep cutting is well worth a visit. It is a bit wet in parts at the Bardsey side of the old rail track and progress on the Thorner side of the bridge is however blocked, or it was when I was last there a year or two back). It's certainly a lot more overgrown down there these days than on the 3D simulation.